There are only a handful of studies about chaplain interventions. None of them are based on a carefully developed, manualized intervention. The paper we discuss in this webinar reports a study conducted as part of the development of a chaplain-delivered, manualized intervention designed to address the existential and spiritual concerns of caregivers of patients with a life-limiting illness. 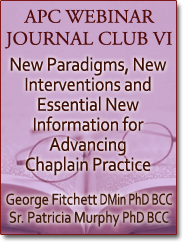 The paper illustrates the work that is required to develop and test chaplaincy interventions. Colleagues who care for patients with advanced illness, and their families, such as colleagues in palliative care and oncology, may be interested in joining you for this webinar. To critically evaluate a model of the existential and spiritual needs of caregivers of patients with a life-limiting illness. To understand the steps required to develop and test chaplaincy interventions. Reading: Steinhauser KE, Olsen A, Johnson KS, Sanders LL, Olsen M, Ammarell N, Grossoehme D. (2015). The feasibility and acceptability of a chaplain-led intervention for caregivers of seriously ill patients: A Caregiver Outlook pilot study. Palliative and Supportive Care. 2015 Oct 29:1-12.